Let’s admit that gentrification is an immoral urban process. It is a deliberate policy of social engineering and needs to be tackled at its source. Gentrify this! Flickr/Spacebahr. Some rights reserved.The marketing mantra of “love where you live” courses through the ongoing ‘redevelopment’ of the Heygate Estate in London’s Elephant and Castle into Trafalgar Place. The City Quays project in Greenwich offers “a private island in London to call your own”. Lillie Square, which will be built on the Earls Court site hawks “modern garden square living” where you can “dwell in luxury”. All these (and many more) are symptomatic of a language of disavowal. It denigrates existing residents and paints them as unworthy of their homes as they were. And it is, in essence, inhumane. But it is just a small part of a sweeping narrative of cities needing to be developed and regenerated, into ever more profitable, consumerist and homogenous centres of middle-class spending. And in all of this, the incumbent residents and their communities are of no consequence. It is a narrative that stretches all the way from advertising-speak to broadsheet journalism. 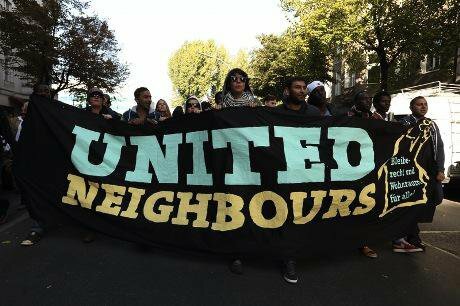 Banner at ‘Reclaim Brixton’ protest. Demotix/Guy Corbishley. All rights reserved.A recent piece in the Spectator by Stephen Bayley, “The moral case for gentrification”, recounts the story of Detroit’s decline and how it is slowly being regenerated by artists and entrepreneurs. He then goes on to suggest that the ideas around the political rejuvenation of ‘Northern Powerhouses’ could be implemented via a large-scale regional gentrification project, much like is happening in Detroit. “Let’s not be squeamish ourselves: let’s admit that gentrification, for its beneficiaries, is nice evidence of social promotion." 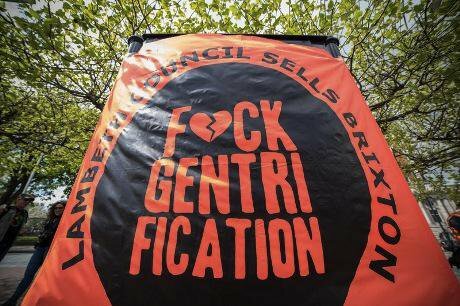 Bayley’s piece is symptomatic of a mainstream discourse on gentrification that is misinformed, misguided and has the potential to do real life damage to people who will eventually be effected by policies that it champions. It echoes other articles from the UK and the US that are proclaiming gentrification as a ‘myth’, or that it’s being mistaken for a process of 'youthification’. 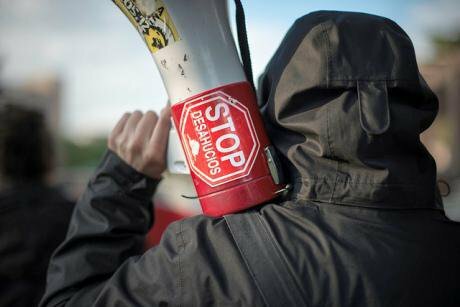 Protests against evictions in Spain. Flickr/Adolfo Lujan. Some rights reserved.Too often, this narrative that excuses gentrification is laced with obfuscating, politically charged and inflammatory language. 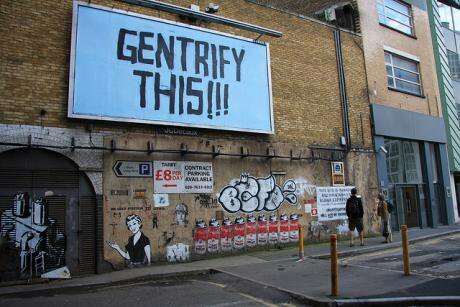 Pro-gentrification proponents pictorialize cities as ‘dead’, ‘degenerate’ or ‘not vital’. Hence we hear terms like ‘regenerate’, ‘revitalise’ and ‘renaissance’. Scholars have written extensively about how such language neutralises and naturalises gentrification, and renders the existing residents as not important. In suggesting that cities such as Stoke are ‘dead’, Bayley is not only guilty of lazy journalism, but its macabre malevolence reduces people’s lives as somehow not worth living. He goadingly suggests that “Stoke’s terraces may yet see a splash of Farrow & Ball, Ocado deliveries, lead planters with box trees and a higher Audi count”, as if the consumerism of London’s middle class is somehow the antidote to chronic and terminal fatalism that currently engulfs the ‘Northern’ city of Stoke-on-Trent. Anti-gentrification activists in Berlin. Demotix/Thorsten Strasas. All rights reserved.Arguments have also become overly-simplistic. Bayley echoes many other generalised articles and states that “gentrification is about middle-class migration and resettlement”. But 50 years of scholarship rightly suggests it is far more than that. Bayley presents gentrification as an inevitability that we must all genuflect to or perish. Labelling cities as ‘natural organisms’ is conceptual trickery, positing development as natural removes any political ideology from it. Tom Slater, an urban geographer coins this as 'false choice urbanism’, which he argues is something developers (public and private) set upon urban locales. “It’s either gentrification (good) or disinvestment (bad), which reduces urbanisation to an ugly morality play that precludes the crucial political question of how capitalist urbanisation and uneven development creates profit and class privilege for some whilst stripping many of the human need of shelter”. 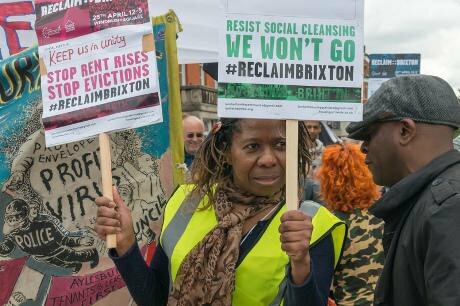 ‘Reclaim Brixton’ march. Demotix/Peter Marshall. All rights reserved.Bayley decries the anti-gentrification debates (of which Slater is a leading voice) as “class-based loathing”, but this line of argument is a putative attempt to whitewash critique of its validity without tackling or having to engage with the subjects it focuses on (namely the urban poor). The existing residents in these places, condescendingly described, are rendered voiceless. 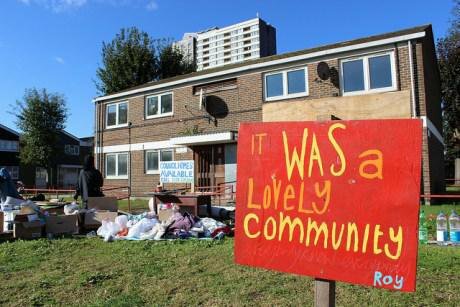 Bayley wades into the recent debate about Robin Hood Gardens, arguing that the “rebarbative … estate will, perhaps, be saved by fashionable youth even as the original tenants disdain it”. Such disdain however stems from a chronic lack of renovation funds. The deliberate withholding of funds for maintenance and upkeep means that of course the buildings will fall into disrepair. Such ‘accumulation by dispossession’ is a classic strategy of developers and is a nefarious attempt to position them as derelict, to which the only remedy is razing, and replacement with units that appeal to the super-rich. The recent expose of Southwark’s mismanagement of the Elephant Park development is a prime example. Eviction of the Focus E15 Mums. Flickr/Liam Barrington-Bush. Some rights reserved.The housing crisis that is currently engulfing London (and will no doubt continue to infect other regions in the country) is a direct symptom of the kind of policies that journalists like Bayley advocate. That crisis, lest we forget, is causing misery and precarity on an industrial scale. Bayley claims a ‘moral justification’ for gentrification. But by linguistically vanishing vast swaths of the urban population, by falsely presenting cities as natural organisms that must ‘develop or die’, by using inflammatory and derogatory metaphors, and by getting basic geographical facts incorrect, he does the exact opposite. Gentrification is an immoral urban process which is directed politically by those seeking to enforce an ideological agenda. It is a deliberate policy of social engineering and needs to be tackled at its source.